We have a little bit of a dilemma surrounding the QB situation in Ann Arbor. 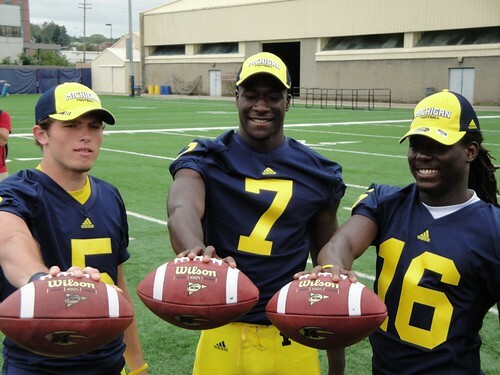 When fall camp began, word was that Denard was making a serious run at the starting gig. He performed very well in the spring game, earning the bulk of the reps with the starting group. He had improved his passing ability, improved his running of the read-option by adding the "read" part. All-in-all, Denard was becoming the QB that Rodriguez had hoped he would when he signed his letter of intent. And then there's Tate Forcier. Obviously the guy with the most experience and playing time from 2009, it almost seemed, at least to me...that the starting QB job was his to lose. We all know that Tate has a ways to go before he's truly the leader of this offense. His biggest problem wasn't his ability or not stepping up when it counts most...not even close. But from what I saw last season, Tate's biggest liability is the real estate between his ears. At times in 2009, he acted like a freshman. Painfully. He pouted on the sidelines when he would be pulled from the game. He made freshman mistakes, and then beat himself up over them. To his credit, he also played injured for half of the year. Just having those two very different, yet very similar QBs in the mix is enough...but that's where things get interesting. "Every day I come in and wonder, 'OK, who's going to separate themselves?' So that's been an ongoing process. With three guys, this is probably as unique a situation I've been in"
"It may seem frustrating and everybody wants to know, but as long as they get better every day and eliminate the mistakes tomorrow that they had today or yesterday, then we'll be OK. That's the big thing. We don't want to keep making the same mistakes, and they haven't been for the most part, but there are some days they do better than others." Obviously, the decision is not going to be made this week as some had predicted it would. In true head coaching fashion when it comes to QB decisions like this, Rodriguez said he won't inform the three QBs until next Friday, the day before the UCONN game. "Nobody else will know until 3:36." Personally, I feel that Denard is making the biggest improvement overall so far. He's certainly been getting the most positive attention. But Tate is a wild card in my eyes. On one hand, he's got a certain flair for the dramatic. He rises to the occasion in big games, at least he did in the beginning of 09 when he was healthy. But on the other hand, I get the feeling that his head is just not in the right place. I have no doubt that he's trying his hardest to win the job. But in his own words on media day last Sunday, he's been "humbled" by the competition from Devin and Denard, who are both roommates, btw. He also said that he "slacked off" in the offseason, which anyone who heard Troy Woolfolk's comments from the Big ten media days in Chicago last month can tell you. But when I spoke to David Molk on Sunday, he said that Tate has been working hard, and that he has been impressed with how much he's trying to win back his starting job. So, take all that for what it's worth. I still think that we'll see Denard stroll out to the huddle when the offense takes the field for the first time on Sept. 4th. But I have very little doubt that both Tate and Devin will see the field against UCONN. All 3 probably won't see equal time, but I'm sure each will have a fair chance to prove himself. So I guess, the next question would be...who starts in South Bend on the 11th? "Certainly it looks like he's lost for the season," Rodriguez said. "He (faces) quite a bit of rehabilitation, but (the doctors) don't see any reason why he can't be 100 percent this time next year." Rodriguez said he spoke with Troy about using his redshirt to come back next year and play. • Mark Moundros is looking to be the starter at middle linebacker. • The OL is not set yet in terms of starters, but 8, 9, or 10 guys could be rotating in regularly throughout the game. • Fitzgerald Toussaint suffered a neck stinger and a sore knee in practice and may miss this Saturday's scrimmage. He should be okay for UCONN though. RB Michael Shaw is reportedly still taking summer classes in order to determine his academic status for the fall. Rodriguez says the RB situation is still "unsettled"...whatever that means. • Michigan's kickers have been breaking in the new turf at the Big House by practicing primarily there lately.